I completed the Certificate III in Wall and Floor Tiling at CIT. I originally left school in Year 10 as I wasn't an overly academic person, and I realised school wasn't the best place for me. Instead I decided to get an apprenticeship so I could get some skills and get out into the workforce. I wanted to be a builder, but the opportunity presented itself for me to do tiling. 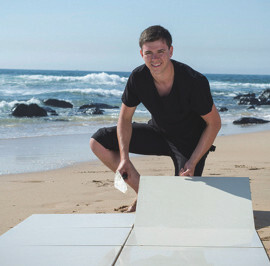 I was offered an apprenticeship through Glenn Swift Tiling and CIT, and since accepting it, I have never looked back. My apprenticeship was four years - with three years study at CIT and one year purely out in the workforce. I really found doing an apprenticeship was an ideal pathway for me. In the classroom at CIT, I found that it wasn't just teachers standing up the front instructing - everything we did was really a class effort. While we did sometimes have to read through text books, we'd always stop and talk things through, and I found this quite valuable. Because we were each doing different things out in our own workplaces, we were all able to share and take a bit of everyone's separate knowledge so you could better yourself. I found this such a great way to learn. My greatest achievement that has come out of my apprenticeship was winning a gold medal at the WorldSkills Australia competition. WorldSkills is a competition which provides an opportunity for young people to showcase their trade and skill talent, and I participated in the wall and floor tiling category. When I was in the first year of my apprenticeship, my CIT teacher Martin Stallard asked me if I wanted to have a go at WorldSkills, so I entered the regional ACT competition. I thoroughly enjoyed the challenge and ended up winning the bronze medal. In my third year of study I decided to enter again, but this time having those two extra years of study under my belt. This time I was awarded the gold medal, which meant I advanced to the national competition in Sydney. The national competition took place over three days, and saw 500 of Australia's best students, apprentices and trainees compete for gold in their area of study. It was a close competition, but I ended up winning the gold medal. Winning means I have joined the Skillaroos - Australia's Worldskills team - and we head to Germany in July 2013 to compete at WorldSkills International. I feel proud that I have been selected to compete in the competition and to represent my country. It is an honour not many people are presented with. Since I completed my apprenticeship, I have been working as a tradesman, still with Glenn Swift Tiling in Goulburn. I enjoy the satisfaction of knowing that I'm now fully qualified to work in the field that I'm passionate about. I feel that my apprenticeship has given me both the knowledge and the hands-on skills for me to do the best job I can at the worksite every day.